In my last post, I shared with you the two blankets I made for the little people. 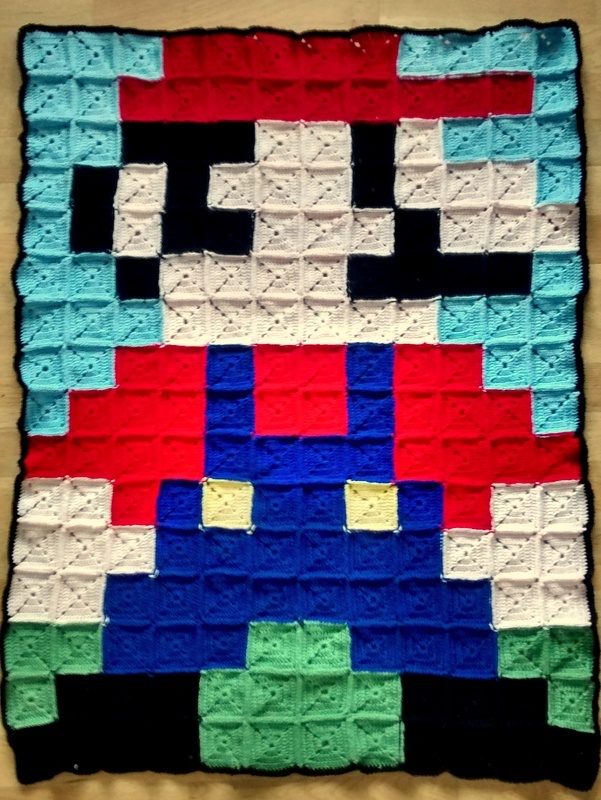 Well in this post I thought I’d share with you how I made the Super Mario Blanket. 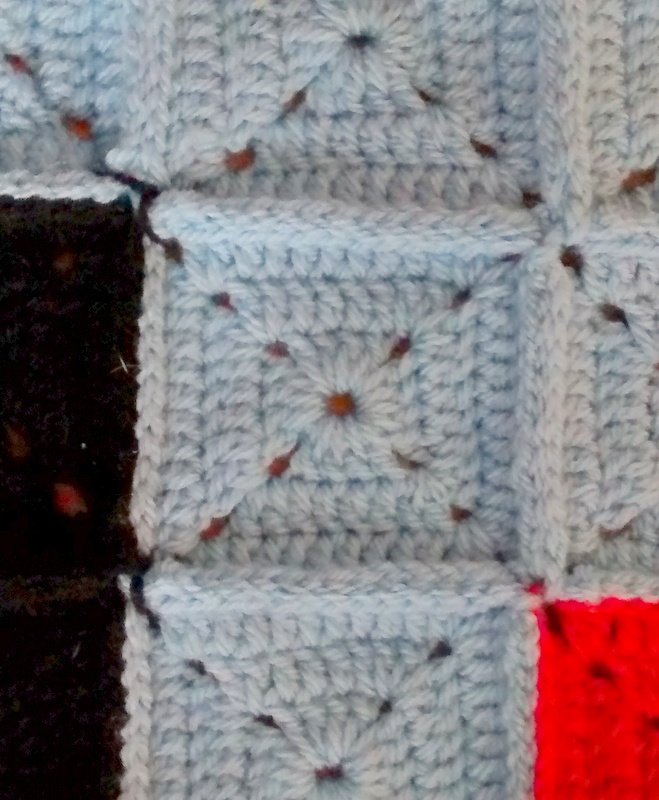 It’s an easy pattern (you only need to be able to make one square and then join them together) but it does take time. I used Stylecraft Special DK from the wonderful lemonade yarns. I chose to make it this size as firstly my little man isn’t that big and secondly, I wanted him to be able to use it without it feeling too heavy. The squares are quite dense. I’ll let you know the number of balls you’ll need for each colour as well as how many squares you’ll need to make. You should get 28 squares from each ball. If you are finding you’re getting less, then you’ll need more wool (obviously). You’ll also need a 4mm hook and I’m using UK terminology. Ch 4 and ss into first ch. Round 1: ch5 (counts as 1tr and 2ch sp), work 4 tr into the foundation ring, ch2, work 4 tr into the foundation ring, ch2, work 4 tr into foundation ring, ch2, work 3 tr into the foundation ring and ss into the 3rd ch from the beginning of the round. Round 2: ss into the 2ch sp from previous round and ch5 (counts as 1tr and 2ch space), work 2tr into 2ch sp, *tr in each tr from previous round, 2tr in 2ch space, ch 2, 2tr in 2ch sp* Repeat *to* 2 more times, tr in each tr from previous round, 1tr in 2ch sp and ss into 3rd ch from the beginning of the round. Round 3: Repeat round 2 then fasten off. Well that’s it. Now all you need to do is make many of these and join them together 🙂 I joined them by dc them together along every edge but you can sew them if you prefer. Here’s a larger picture of the blanket so you can see clearly what order they go in (sorry about the quality of the picture, I have to use my phone camera and it’s not the best!). To finish off the blanket I dc around the edge in black. I personally like it as a way to bring everything together but you don’t have to. If you do make this blanket, I’d love to see how you get on. Please post a picture on my facebook page or tweet me. It really is awesome, both my boys would love this! Thank you my little man loves it. It’s actually really easy if you crochet but it does take a while to put together! lol.